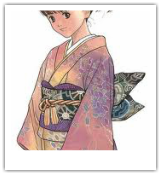 Kimonos, otherwise known as an yukata, are the tradition clothing for men, women and children of Japan. It is often worn with the traditional footwear which is "Zori" or "Geta" and with "Tabi" ; the traditional split toe socks. Now let's look at Japan's latest fashion styles! In Japan, some people like to wear different shades of grey and black, with patches of bright colour, such as pink or white in various places. Others may prefer to wear really bright colours, taking many shades of different colour to create a fashionable style. They normally add on jewellery, and girls prefer to wear skirts, or possibly shorts on tights. Some others also wear jeans.